Admission to all ResoSummit performances is included in the registration fee for ResoSummit. Participants also have the opportunity to purchase "Friends & Family" tickets for their guests. General public: Tickets will be available at the door on a space-available basis. Please note that The Station Inn is an intimate venue, and we expect all ResoSummit performances to sell out shortly after the doors open. ResoSummit proudly presents true Dobro icon Mike Auldridge at the Station Inn this year, performing with Darren Beachley & Legends of the Potomac, a recently-formed band that pairs top-tier Old School talent with contemporary bluegrass creativity and drive. 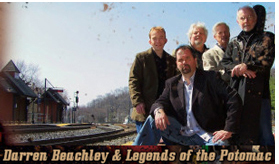 Darren Beachley recently completed a milestone-marked tenure as lead/tenor singer with Doyle Lawson & Quicksilver: the first song he recorded with DL&Q, "He Lives In Me", is the second-longest charting southern gospel song in history, and was named Recorded Event of the Year by the International Bluegrass Music Association (IBMA). Bassist Tom Gray is well known as part of the "classic" Country Gentlemen (a role which led to his induction into IBMA's Hall of Fame), and as a founding member of The Seldom Scene, along with Mike Auldridge. Norman Wright has a rich history that includes stints with the Bluegrass Cardinals and the Country Gentlemen, campaign work with Senator Robert Byrd, and Hee-Haw and Grand Ole Opry appearances; he is a prolific songwriter with cuts by IIIrd Tyme Out, DL&Q, and many others. Mark Delaney is a highly regarded player of the instrument Dobro players lovingly call the ojnab (known to others as the banjo); he has worked with Randy Waller & the Country Gentlemen and other notable bluegrass bands, and has performed with bluegrass greats Charlie Waller and Buzz Busby. Something pretty magical is bound to happen when these two musicians take to the stage on Saturday night. Two-time IBMA Guitar Player of the Year Jim Hurst was raised with a guitar in his hands, with early influences from flat-lickers such as Tony Rice, George Shuffler, Doc Watson and Clarence White. the finger-style playing of Merle Travis, Chet Atkins and especially Jerry Reed provided "a turn in the road" for Jim. Those varied influences have contributed to a signature sound that make Jim's performances both jaw-dropping and delightful. Rob needs no introduction to ResoSummit. He has performed at ResoSummits past with Blue Highway, Three Ring Circle, and the Road Song trio that includes jazz pianist Michael Alvey and vocalist Robinella. This year, we are delighted to present Rob in a duo that the Nashville Scene calls "a fearsome combination." "...NewFound Road is a revelation--an innovative template of how bluegrass can remain thrilling and relevant by fusing the best of the past to a clear vision of what is essential today." ResoSummit will showcase next-generation bluegrass at its best in the Thursday evening Station Inn performance that opens ResoSummit. New Found Road is "a band at the top of its game" with "wonderful harmonies, tough-edged pickin' and killer song selection" (Dave Higgs, Nashville Public Radio); it is "the genuine article . . . if you like your bluegrass heartfelt and straight" (Vintage Guitar Magazine). Special guest Justin Moses is a multi-instrumental phenom who appears on New Found Road's latest CD. A founding member of the band Sierra Hull & Highway 111 in 1995, he peformed with Blue Moon Rising and NewFound Road in 2006 and 2007, before being asked to join the Dan Tyminski Band in 2008. This year will mark his debut appearance as ResoSummit faculty.